Low polygon art is an interesting result that’s recently made an appearance through digital abstract creations. The new Inkscape 0.91 has Voronoi diagrams and Delaunay triangulation, which is what we’ll be using to very easily create poly art in this tutorial. 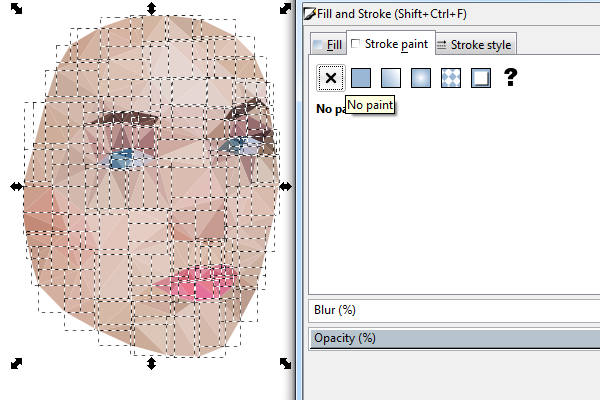 For this low poly tutorial, we’ll be using a photo of this pretty lady to do a polygon trace. Go ahead and drag this (or any) image into Inkscape. Use the Ellipse tool to draw a small, bright red dot. Now you’ll want to copy and paste these dots along any detail points in the image. You see what I mean, right? Remeber: the more detail you want, the more dots you do, and that much more work will be needed later on. Here’s my finished dot map for the Delaunay triangulation. As you can see below, I’m only doing her face at a pretty low detail. 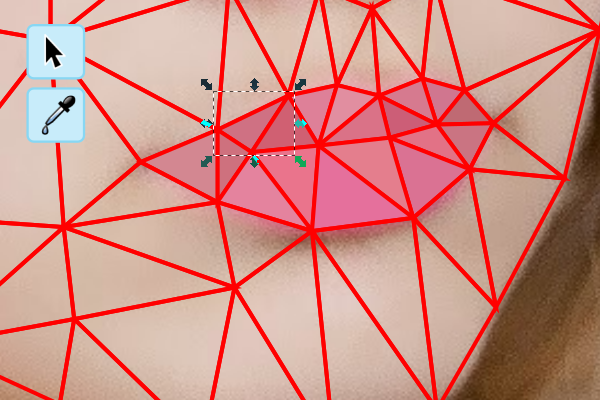 Select all of the dots and head up to Extensions > Generate from Path > Voronoi Diagram. Change the type of diagram to Delaunay Triangulation along with the bounding box of the diagram to Automatic from selected objects. Then hit Apply to watch the magic happen. Now you should have a full wireframe that accentuates details. Below, I selected the wireframe and the image to move them away from the original dots, because manually deleting the dots would be a pain. Also, Ungroup the wireframe, which is actually just a bunch of individual triangles. Unfortunately, this next part is tedious because I can’t find a better way to do it. The concept here is to select each triangle with the Selection tool (F1) and then set the Fill color by using the Color Dropper tool (F7). Thanks to a fellow reader from the comments section, you can simply use the Dropper tool and just keep hitting the Tab key to cycle through the triangles. Below, you can see I colored her lips accordingly. Go ahead and do every single triangle this way, which should only take a few minutes. Once you have all of your polygons colored, select them all and remove the Stroke paint. When you remove the Stroke paint, you’ll see tiny white spaces in between every triangle. A quick trick to remedy this is to duplicate (control+D) the entire set of polygons over themselves. Looks pretty good! 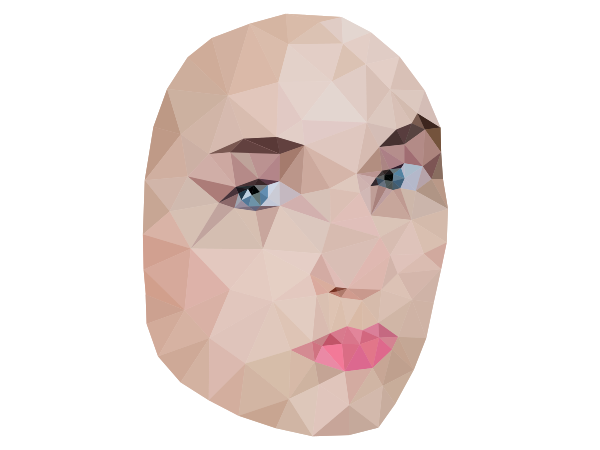 With the newest addition of Delaunay triangulation in Inkscape, we were able to easily create a low poly version of a woman’s face that actually looks pretty good. You can definitely take the extra time to do more detail, better coloring, etc. Oh, and if any of you know a better way to accurately color all of those polygons, let me know! Thanks for reading.